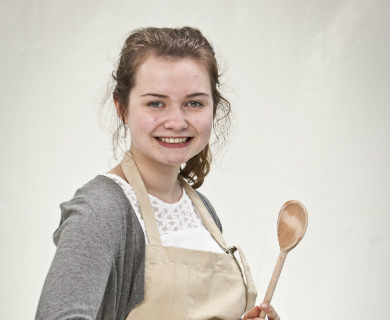 Martha is the Great British Bake Off’s youngest ever baker and, at just 17 years old, she combines baking with her AS Level exams and coursework, taking revision breaks to make a tower of profiteroles or a batch of macaroons. Martha is studying Food Technology, Maths and Chemistry and wants to be a food scientist when she is older, saying: “I may be in school, but my head is always in the kitchen.” She lives with her mum, dad and younger sister and their white labradoodle Alfie – who steals Martha’s bakes whenever possible. Martha’s earliest baking memory is baking rock cakes and pizzas with her mum. Working on the cheese counter at a supermarket gives Martha inspiration to try different cheeses and flavours in her bakes. Martha is fascinated by the science of baking, such as why cakes rise, why choux pastry puffs up and what goes on inside bread to give it structure. She is determined to turn this fascination into a successful career as a Food Scientist and has bookcases full of recipe books which she reads cover to cover, tweaking and improving on the original recipes.